Demolition, floors, electrical systems, HVAC systems, etc. Sachse Construction completed a historic buildout of 751 Griswold for MarxModa’s new office in downtown Detroit. 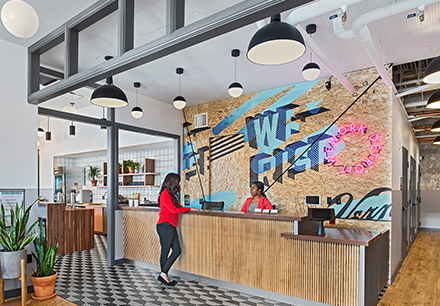 Working with Gensler Detroit, the project team created a modern office for the furniture supplier by blending contemporary work space functionality with the original charm of a historic Detroit building. The interior renovation included complete restoration, installation of a new mechanical system, elevators, plumbing, and electrical work. Constructing in a historic space required paying special attention to unique elements with a focus on integrating new construction with restored original components. MarxModa’s new office contains a number of original features including terrazzo floors, a marble staircase, bank vaults in the basement, and an intricately painted ceiling in the showroom. The project team worked diligently to restore the building’s boardroom including its crown molding. Where the original molding was too damaged to be restored, it was replicated using molds to match the original look. The project also includes a number of modern upgrades including specialized casework, specifically designed and constructed to house the company’s catalog of furniture samples. MarxModa’s new Detroit headquarters encompasses a free moving office environment built to inspire productivity through an innovative and practical layout.